World class baroque, classical and choral music performed by one of the leading symphony orchestras in the world. Categories include celebration, baroque, chamber, cheeky, choral, organ, piano, popular, powerful, romantic and more! Over 50 beautiful tracks! Buy all 10 collections in this library for: $519.95. Individual collection prices are listed below. Refreshing Chopin tunes played on a piano. A collection of seven powerful and festive classical pieces. A dozen chamber pieces ranging from perk and positive to mellow and melancholy. Cheeky tunes for whatever cheeky event you are planning. Smooth serenades and happy harpsichords. Stunning classical choral pieces that will have the hair on the back of your neck standing up. Bach and Mozart played on an organ. The familiar and the famous from the classical world. Strong and bold orchestral piece to invigorate your spirit. Music for a lovely, quiet evening sipping wine and staring into each other's eyes. 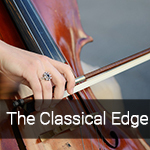 A variety of classical music to suit any taste.